With the certification requirement that is in, BC Soccer prepared its member organizations and affiliate clubs to meet the challenge of training all Head Coaches with age appropriate coach education. A call to action was initiated and BC Soccer offered all organizations to put forward individuals who hold technical leadership roles to become trained as a qualified BC Soccer Learning Facilitator (LF). After an overwhelming response, we trained over 120+ individuals from all regions across the province to enable organizations to be able to train their coaches with an “in-house” Learning Facilitator delivery model at the Community Coaching course levels. “We place a great value in coach education and it is important to us that coaches who experience these BC Soccer’s services are trained by competent and passionate Learning Facilitators”, explains Rob Csabai, Manager of Coaching Development. “Our aim is to ensure that all our facilitators are equipped to demonstrate a high level of quality and consistency when delivering the Canada Soccer/BC Soccer Community Coaching courses”. The process for individuals to become a BC Soccer Learning Facilitator comes with a few steps and applicants must meet minimum requirements prior to being approved to begin the training process. We have laid out a pathway for individuals who meet the application criteria with multiple training points, supportive delivery opportunities and once the LF has gained experience, the next step is to evaluate their progress and provide feedback. This is done through a LF Support Visit and Evaluation opportunity provided by a BC Soccer mentor Coach Developer. Once a candidate’s application has been approved by BC Soccer, the individual will be notified about the next steps regarding the training process. Our objective with the LF Support initiative is to provide support and an evaluation opportunity to our Learning Facilitators who are responsible for inspiring coaches to develop players in British Columbia. We have developed detailed evaluation criteria based on previous training content laid out within the following main evidence categories. 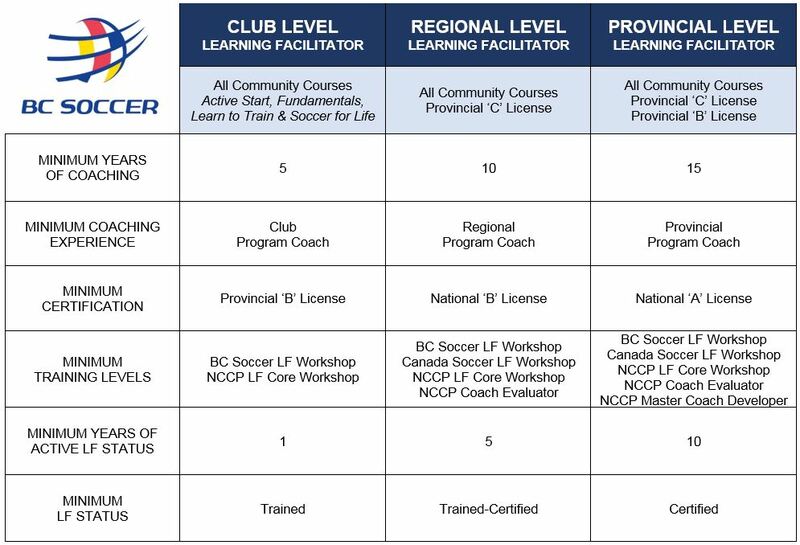 BC Soccer’s pathway outlines the requirements for Learning Facilitators, the training process and the support initiative to ensure that our team of LF’s are trained and qualified to deliver Community coaching courses at the Club Level. For those individuals who have been evaluated and selected to deliver the Licensing coaching courses, they must meet higher standards.